Look after your tools. Remove rust on metal tools by first rubbing the area with emery cloth or a wire brush. Then wipe the blades with an oily cloth, or spray with a lubricant and rust inhibitor. If the metal chassis of the lawnmower has rusted, sand it down and paint it with red oxide, then a couple of coats of hardwearing exterior paint. Now is a good time to preserve wooden tool handles and garden furniture, by wiping with a cloth soaked in linseed oil or teak oil. Use a cloth that is damp with white spirit; wipe any dried plant sap from knife blades. This is a good habit to get into as it also stops the spread of pests and diseases. Oil the hinges of penknives, and also sharpen your knives on a regular basis as a blunt knife is more dangerous than a sharp one, it is also really frustrating to have tools that don’t work properly and you will also need to exert more force to make a cut. Also allow enough time to store your tools in a correct way, by hanging them in logical fashion on your wall – not heaped on the floor. There are several tool racks on the market and handy hooks available from garden centres and DIY stores. 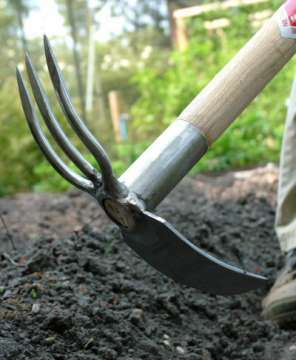 You can make your own by using a piece of limber and fixing lengths of broom handles to it – it is a great way to hand up spades and forks and other garden tools. Tool bags are useful for storage of small tools like trowels, hand forks, bulb planters and so on. I have a bag with several compartments in it and I find it invaluable for carrying tools, labels, gloves and string etc.